For many environmentally conscious consumers, finding a car that keeps in line with their views is very important for them. One of the most eco conscious vehicles on the market is the 2014 Honda Insight. It has all of the features that people have come to expect from Honda vehicles, but with one big difference, it is a hybrid. This means that you will run on both electricity and fuel, which releases far less dangerous emissions in the process. If you feel like this is the car for you, then you can visit Honda of Pasadena and purchase one today. 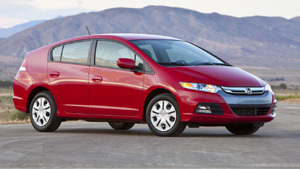 Many people choose the 2014 Honda Insight because it has many safety features that are very enticing to most car buyers. The Insight features both driver and passenger dual stage airbags, which will add unparalleled protection in the event of a wreck. The Insight also has a ABS system that has a brake distribution feature that helps to prevent the brakes from locking up and causing an accident. The structure of the front portion of the Insight is also designed to distribute the energy produced by a wreck evenly which can help to reduce the amount of damaged caused. Many people have the misconception that hybrid cars have a rougher ride than other cars due to the small stature, but with the Insight you get the best of both worlds. You get the drivability and handling of a gas burning car, but without all of the dangerous emissions. The Insight has a very smooth ride, due to the gas shocks that is has and the eco assistance package. If you are looking for a car that is both comfortable to ride and small enough to reduce the amount of gas you have to purchase, then the 2014 Honda Insight is the car you are looking for. Perhaps the biggest benefit of owning a 2014 Honda Insight is that is has great gas mileage, which can help to reduce the amount of money you spend to fill it up and drive around town. The Insight can take you more places than most other hybrids, which can garner considerable savings on your gas bill. Honda has also put in an Integrated Motor Assist, which allows the engine to change from gas powered to electric powered in certain situations. If you are looking for one of the best hybrid vehicles on the market, then look no further than the 2014 Honda Insight. You can purchase your 2014 Insight at Honda of Pasadena. This entry was posted in 2014 Honda Insight Hybrid and tagged 2014 Honda Insight Hybrid by Honda Pasadena. Bookmark the permalink.